Following petition, record a deed of distribution pursuant to a court order to convey, transfer, or deliver property as proof of a distributee's succession to the decedent's interest in real estate. The deed of distribution includes a covenant to the grantee that the PR has legal power and lawful authority to convey and release the title. 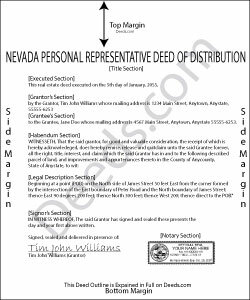 Consult an attorney licensed in the State of Nevada with questions regarding deeds of distribution or other issues related to probate.